Hello everyone, Happy Monday. 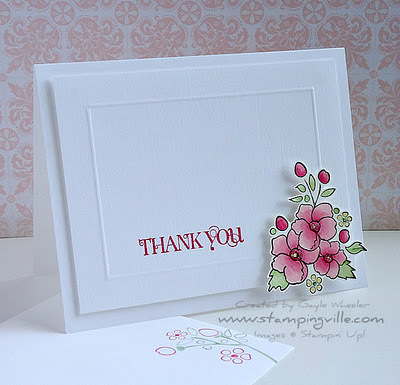 I was needing a to make a Thank You card for a friend and then I noticed that Card Camp a yahoo group I belong to was having a Cased Card Challenge this week. The above card is the card we were supposed to case. Here is my cased Thank you card. That's all I have today. Have fabulous day! Ahh, Mary yiou are far to sweet. Thanks for stopping by and saying Hi! These are just lovely! I don't know what it is about pink and orange, but don't they just go so well together? These are wonderful cards, and really inspiring! Pretty card! I love all the sparkle! Found you on the Outlawz and am your newest follower!